As Labor Day weekend approaches, AKA Creative is coordinating a community event to honor Charlotte’s entrepreneurs, creatives, and social innovators. 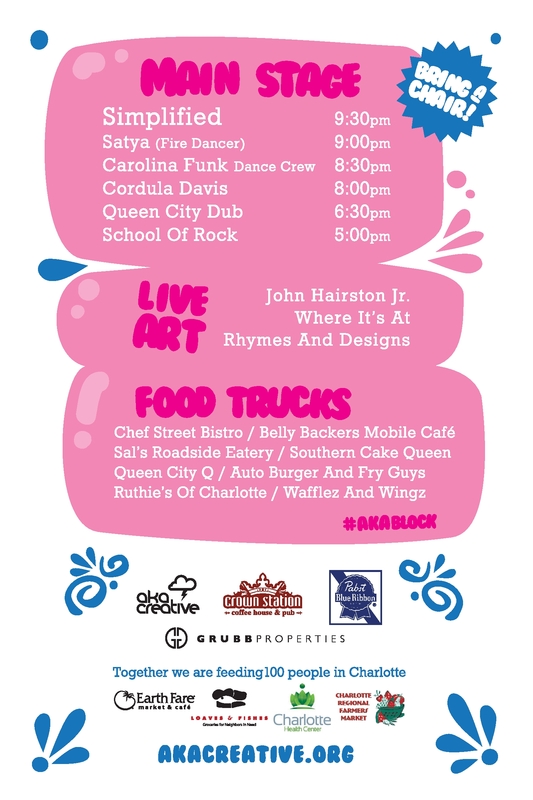 The Elizabeth Avenue Block Party, scheduled for Saturday August 31 from 5pm to 11pm, will close down Elizabeth Avenue between Charlottetowne Ave. and N. Torrence Street to fill the road and its attached grassy knoll with food trucks, visual artists, musicians, performers, vendors, and Charlotte residents. The event is free and appropriate for all ages. The block party is not only a neighborhood celebration, it is also a neighborhood giveback. Attendees can donate $15 to help feed families in need of a little help from a fellow neighbor. As with all AKA Creative events, the Block Party will include a pro-social element. Earth Fare will donate packaged goods, produce and grocery bags, and Dr. Holly Clemens of Charlotte Health Center will provide healthy recipe cards. Block Party attendees will help out by sorting donations, stuffing grocery bags and writing encouraging notes to the grocery recipients. Loaves & Fishes will collect the bags and provide them to those families in need. The Block Party keeps us in touch with the people who helped us become so successful in our first year. Planning this block party has already allowed us to forge new collaborations within the community. If it’s successful, we intend to make it an annual event or outdoor event series. Entertainment will be provided by a bevy of local talents in Charlotte’s music, visual art, and performing art scenes. And several of Charlotte’s finest mobile entrepreneurs will park their food trucks and set up shop. 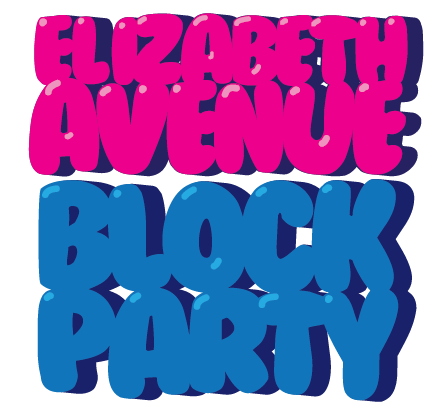 Check out the Elizabeth Avenue Block Party lineup in the flyer above, and get the latest updates from the the official website, Facebook, and Twitter.